Just as Amazon Web Services (AWS) has transformed IT infrastructure to something that can be delivered on demand, scalably, quickly, and cost-effectively, Amazon Redshift is doing the same for data warehousing and big data analytics. Redshift offers a massively parallel columnar data store that can be spun up in just a few minutes to deal with billions of rows of data at a cost of just a few cents an hour. It’s designed for speed and ease of use — but to realize all of its potential benefits, organizations still have to configure Redshift for the demands of their particular applications. Whether you’ve been using Redshift for a while, have just implemented it, or are still evaluating it as one of many cloud-based data warehouse and business analytics technology options, your organization needs to understand how to configure it to ensure it delivers the right balance of performance, cost, and scalability for your particular usage scenarios. 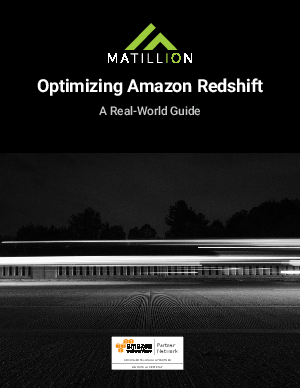 Since starting to work with this technology in September 2013, Matillion has used Amazon Redshift to deliver dozens of data warehousing and analytics projects. Download this e-book for practical advice, real-world examples, and best practices for optimizing Redshift configuration and performance.